On March 24, two days after Dane County Judge Josann Reynolds, (Branch two), ordered Scott Walker to call two special elections, and one day after Republicans vowed to enact legislation blocking the judicial order, the Wisconsin State Journal ran a banner, 3/4-inch headline reading “State GOP seeks swift action” in its print edition. This March 24 headline misleads readers with the undefined “seeks swift action,” omitting the fact state Republicans scrambled to continue to block elections, (as the news piece reports). If Reilly were trying to edify Scott Walker, he would have better luck shouting at the wind. Via MAL Contends . . .: Scott Walker Does Not Understand Democracy and Voting Rights even After Three Judges Attempt to Explain. If these allegations from CREW [Citizens for Responsibility and Ethics in Washington] are true, and if it you put it together with Walker campaigners that have ties to Cambridge Analytica, it sure seems possible that WisGOP was illegally working with organizations like Cambridge that are supposed to be operating independently from candidates and parties in both 2014 and 2016. And if Walker and WisGOP were not reporting those expenses, that’s a major campaign law violation.The Cambridge connections make the $1.1 million that Ukrainian oligarch and Putin buddy Len Blavatnik gave to Walker’s epic fail of a presidential campaign interesting, doesn’t it? It also makes me wonder what favors may have been returned to these outside groups from the Governor, Legislature, and other WisGOPs in return for all of this “research”? Via Jake’s Wisconsin Funhouse: Some Trump/Russia links, snooping is leading back to Wisconsin. If you stage events with political hacks and yes-people who praise you for giving them policy rewards for their campaign contribution there is no way a real understanding of the our state will ever be had. Via Scott Walker Can Not Distinguish Cronies From Citizens @ CAFFEINATED POLITICS. 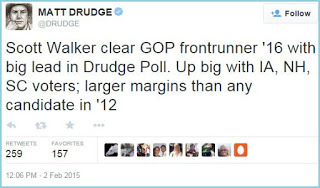 Via Wigderson: Scott Walker Needs To Endorse Ted Cruz @ Right Wisconsin. Gov. Scott Walker has claimed he only recently learned about the problems at Lincoln Hills, but there is a mountain of evidence suggesting otherwise. Back in February 2012, Walker received a letter from Racine County Circuit Judge Richard Kreul about Lincoln Hills, as the Journal Sentinel has reported. The letter included a copy of a memo detailing the beating and sexual assault of a boy and the failure of Lincoln Hills staff to notify law enforcement and child protective services. “The indifference in this sordid tale is absolutely inexcusable,” Kreul wrote. Via Beyond negligence @ Isthmus. NEENAH – As his former presidential rivals crisscrossed Iowa for caucuses Monday, Gov. Scott Walker stoked the fire on whether he would seek a third term as Wisconsin’s governor.While Walker said he is considering a run for a third term, which would begin in January 2019, count him out for a fourth: “My wife says if I thought about a fourth term, she’d slit my throat,” he said Monday at a private event at the Neenah Club…. Via Walker hints at run for third term in Neenah visit @ Appleton Post Crescent. Political Heat: Can Scott Walker be trusted to fix Wisconsin’s water crisis? To review – in addition to being a potential fraudster, Scott Walker and his campaign couldn’t even run the grift of laundering funds between his campaign accounts very well. Those campaigns are now broke on the state side, his presidential account is $1.2 million in debt, and Walker is disliked by pretty much anyone outside of a dwindling bubble of right-wing Wisconsinites. In addition, many potential donors are going to be limited in how much they can give to Scotty for the next 3 years. Yes, the GOP Legislature agreed recently to double contribution limits to $20,000 for a Governor’s campaign,but those $10,000 donations all count towards that $20K. So if anything, Walker’s failed money-laundering operation puts him at a DISadvantage for fundraising for 2018. And I doubt think Scotty’s impending home sale (where he’s asking for less than assessed value!) will allow his 27% credit card-having self to fund his own campaign after the Kochs and other right-wing oligarchs cut him off. Via Jake’s Economic TA Funhouse: Walker’s campaign financing is sketchy for two offices. A key to Walker’s re-election in November 2014 was that he won decisively in Northeastern Wisconsin, and in much of rural Wisconsin. Which is why it is noteworthy that Walker’s declining approval ratings aren’t just limited to the urban parts of the state, but are dropping throughout Wisconsin, putting him significantly underwater everywhere except the Milwaukee suburbs. Via Jake’s Economic TA Funhouse: Marquette Poll shows Walker has lost NE Wisconsin, and Bernie can win it for Dems. Via Cognitive Dissidence: This Day In History.